In order to execute a successful pay-per-click (PPC) marketing campaign, a significant amount of split testing is typically involved. With Facebook ads, for example, you need to test the image, value proposition, call-to-action, headline, body text and audience for each ad. Because of the infinite number of combinations available to test, it often takes some trial and error before you get an ad that has a high click-through-rate (CTR) with a low cost-per-click (CPC). Even once you’re able to send prospective buyers to your website, you’re still not home free. Next, you need to test a number of things on your product page before you can achieve a good conversion rate. Did you know only 22% of businesses are actually satisfied with their conversion rates? In fact, 85% of marketers are now focusing on conversion rate optimization. If you aren’t meticulously split testing your product pages, then you’re leaving money on the table. There’s no one-size-fits-all approach to split testing. What works for one business may have disastrous results for another. Bearing that in mind, here are some of the product page split tests that you can conduct to improve your eCommerce conversions. Your add-to-cart button should be the focal point of your landing page. If people don’t notice it, for whatever reason, this will negatively impact your conversions. Much has been written about the ideal color for add-to-cart buttons, and there are no definitive answers. One point of view is that you should choose a color for your button that dramatically contrasts with the rest of your branding in order to stand out. But there is no conclusive evidence that this works. In a study of 50 leading eCommerce brands, 32% used orange add-to-cart buttons while 24% used blue. There wasn’t a consensus about what worked best because every company is different. However, it’s worth your time to split test several different colors for your business. In an eCommerce split test performed by Receptional, a click rate increase of 344% was achieved by changing the store’s add-to-cart buttons from orange to purple. The way you present your pricing information is incredibly important. 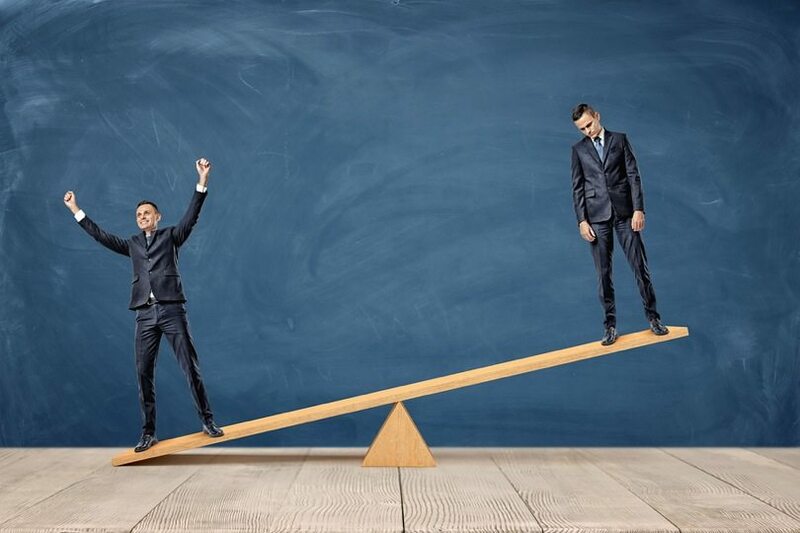 You can test the results of tiered pricing vs. straight pricing in a split test. With straight pricing, you simply display the price of the product. With tiered pricing, you offer prospects the appearance of options (even though most will elect the middle choice in a tier). Variant A (below) represents straight pricing. Variant B, from web host iPage, represents tiered pricing. In addition, think carefully about whether your pricing information is displayed prominently enough on your product page. 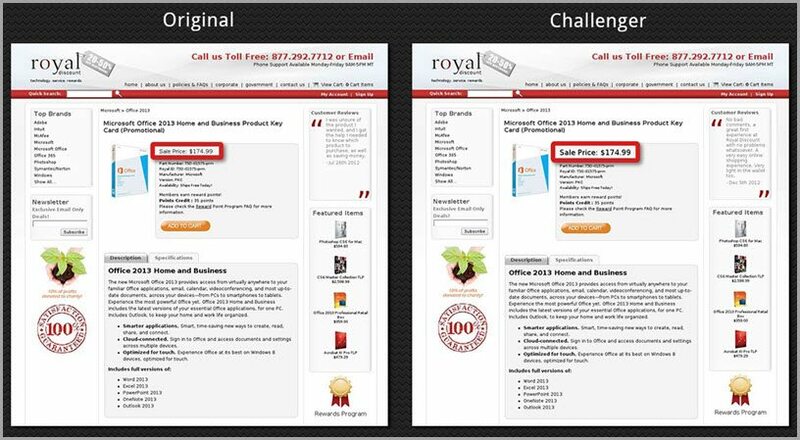 Royal Discount, an eCommerce company that offers discounted computer software from recognized manufacturers, uses a business model dependent on competitive pricing. The company hypothesized that pricing information on product pages may not have been sufficiently emphasized and was harming conversions. It added a crossed out Manufacturer’s Suggested Price, next to the display pricing, which boosted conversions slightly. Next, it ran a split test for 30+ days where sales prices were displayed in bold, and in a larger font size (compared to the control landing page). The new landing page improved conversions by 36.54%, increasing the company’s revenue by 10.21%. In addition to split testing your pricing displays, you may want to experiment with increasing your product prices and offering free shipping to compensate for that. Unexpected shipping charges at the checkout are the number one cause of abandoned carts so this also helps solve that problem. Customers will be more inclined to purchase if they think they’re benefitting from free shipping, even if they’re actually paying you exactly the same amount of money. After all, it doesn’t matter to you whether you receive $15 for a product and $5 for shipping, as opposed to $20 for a product and $0 for shipping. 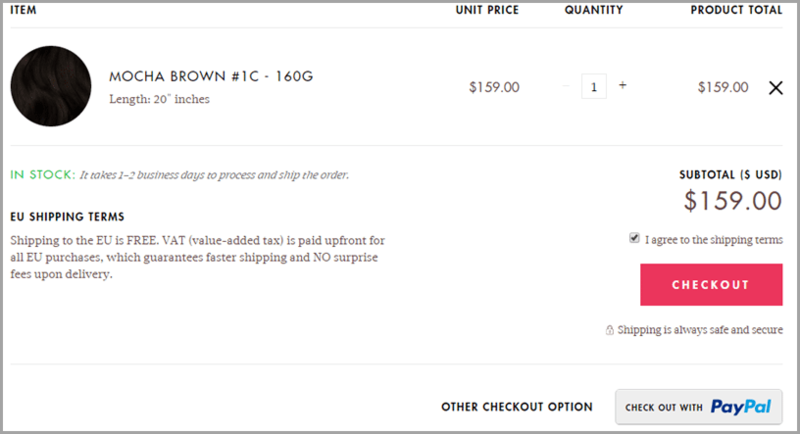 What matters is increasing the number of conversions on you product page – so be sure to split test different shipping options. NuFace, a manufacturer of skincare products, experimented with placing a ‘FREE SHIPPING OVER $75’ banner prominently on its online store. This test resulted in a 90% increase in orders, as well as a 7.32% increase in average order value. In other words, the free shipping offer enticed people to buy additional products at the store. It’s universally acknowledged that having social proof elements, such as customer reviews and testimonials, on a product page is a good thing. If you’ve just arrived at an unknown company’s website via a Facebook ad, it’s unlikely you’ll purchase from them unless they’ve won over your trust. According to a study by Nielsen, 92% of people will trust a recommendation from someone that they know and 70% of people will trust a recommendation from someone that they don’t know if they’re exposed to factors that build trust. Posting testimonials, reviews and possibly even celebrity endorsements on your product page will help to alleviate anxiety and increase conversions. FigLeaves, a retailer of women’s clothing, improved conversions by 35% after adding customer reviews to the site. Test whether reviews improve your conversions. If you get a positive result, also test where your reviews are positioned on your product page. A range of star ratings also help to build trust, unlike an abundance of sugarcoated 5-star reviews with no signs of negativity. In the real world, no company is flawless and consumers understand this. They expect to see minor criticisms. Vegan Horizon, a manufacturer of cruelty-free, non-leather accessories, improved conversions by 9.8% after installing Sales Pop – a Shopify app that displays pop-ups of recent customer purchases for social proof purposes. You may also want to split test Facebook comment screenshots as a form of social proof. Check out this screenshot of a product page by Frontline Gadgets advertising a tactical watch. With so many links and positive comments posted on a reputable social media platform, this simple screenshot demonstrates authenticity and trust. Falling victim to online fraud is a legitimate concern for today’s consumers. If someone is going to enter their credit card details at your checkout page, they need to feel safe and secure in doing so. In a study on cart abandonment, 13% of shoppers stated that security concerns were an issue for them. One of the best ways to deliver a firm sense of security is by featuring a trust badge on your product and/or checkout page. Symantec, formerly known as VeriSign, is one of the most well-renowned Internet security companies. Its distinctive trust badge is highly recognizable. By incorporating this trust badge on a request-a-quote landing page, Blue Fountain Media increased their conversions by 42%. You can also test a money back guarantee (if appropriate) on your landing page, since this alleviates consumer anxiety about buying a defective or misrepresented product. If you’re using Facebook ads to send traffic to your product page, carefully consider the comments you receive beneath the ads. If people are asking the same questions time and time again, provide answers to them on your product page. Cover the features of your product in your FAQs, as well as any potential shipping and delivery queries. The more detailed information you can convey, the more people will feel secure in making a purchase. Although building a FAQ section can be tedious, it’s definitely worth the effort. If you use Inspectlet to watch how visitors interact with your landing page, you might be pleasantly surprised to see how much time they spend browsing your FAQs. 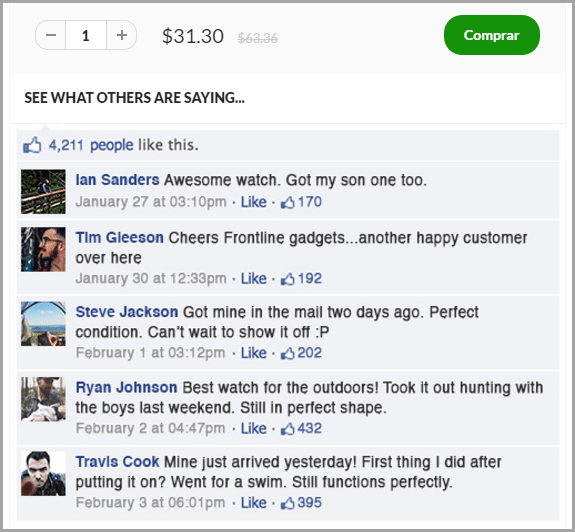 While not an eCommerce brand, non-profit organization Kiva improved its conversion rate by 11.5% as a result of featuring FAQs on the company’s donation page. In a study of online shopping, 28% of shoppers revealed that they abandoned purchases when their preferred method of payment was unavailable. Since 57% of shoppers use their credit/debit cards while another 29% use a digital wallet such as PayPal, you can retain most customers by offering both options. If you’re using Shopify, register a PayPal business account and enable PayPal checkouts on your store. The process is very straightforward and can dramatically improve your conversion rate. Additionally, you can allow visitors to check out via PayPal without registering a Paypal account. Check out the following guide for doing so. 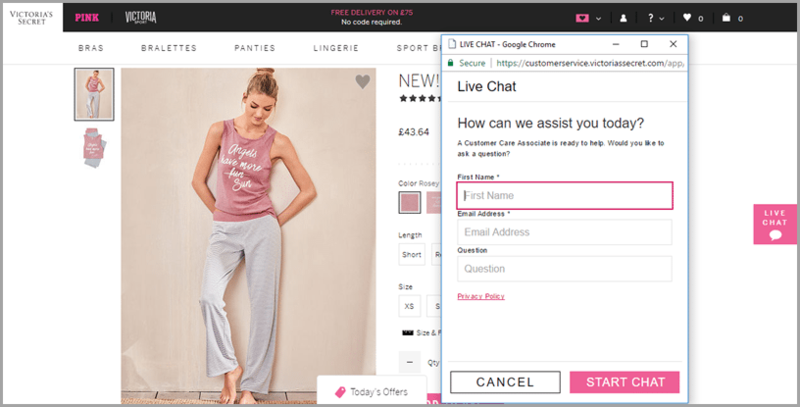 If you’re driving a sizeable amount of traffic to your product page but your conversion rate is poor, you might want to consider integrating a live chat feature on your site. Research indicates that visitors invited to chat are 6.3 times more likely to become customers than those who don’t chat. Similar to FAQs, live chat can help alleviate fear and build trust. Plus, live chat is far more personal – it allows you to answer any specific queries as well as inject some humanity into your brand, which ultimately boosts conversions. Live chat can also be extremely great at reviving abandoned carts. By inviting these individuals to speak with you in real-time, you get feedback as to why they haven’t gone through with the purchase. Then you can (hopefully) make the necessary adjustments to get them to convert. Split test whether live chat works for you. If you don’t notice an increase in conversions with live chat enabled, don’t pursue it, as it can eat up a lot of time. Visual content, particularly video, is essential if you want to engage consumers in this distraction-ridden age of information. In fact, a study by Microsoft shows that the average person now has a shorter attention span than a goldfish. A video is a sensory-rich medium that allows you to convey your message effectively and engagingly. A store selling paintball equipment, Paintball Online, integrated videos on more than 5,000 product pages. The result was that pages which included videos were viewed for two minutes on average whereas pages without videos were viewed for only 35 seconds. There are many talented freelancers on UpWork who can put together an inexpensive whiteboard explainer video to showcase your product. Put a video on your product page and test whether it improves conversions. You need to encourage consumers to purchase your product from the moment they arrive at your landing page – otherwise, they might procrastinate and plan to return to the page later. You can run a retargeting campaign to re-engage former visitors to your site, but you’ll spend less money on ads if they convert the first time. By using urgent language and conveying the scarcity of your product, visitors will be encouraged to convert then and there. One of the easiest ways to inject urgency into your product page is with a countdown timer. If you’re using Shopify, try installing the Hurrify app and testing the results. Marcus Taylor says on Conversion XL that he achieved an incredible conversion rate boost from 3.5% to 10% by putting urgency and scarcity elements on his landing page. The new landing page featured a countdown timer and a counter of products currently sold (which leveraged social proof). Taylor split tested both landing pages simultaneously and logged the results. If someone believes that your product is in limited supply (and there are social proof elements that suggest the demand is high) your conversion rate is likely to increase. While we might have only covered the tip of the iceberg, I hope this post has shown you how valuable – and I would say necessary – using product page split tests is to improve your eCommerce conversions. Can you think of any other product page split tests that can help improve your conversion rate? Please let me know in the comments below.